Katherine is the fourth largest town in the Northern Territory, Australia, 320kms SouthEast of Darwin, located on the banks of the Katherine River. 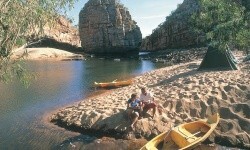 Situated in the 'Top End' of Australia, Katherine is a a popular stop off on the route between Darwin and Alice Springs. Katherine is a regional town with a population of nearly 10,000 people, with many of them being local indigenous Aboriginal people. There is no airport in Katherine but you can fly to Darwin or Alice Springs, or access Katherine via car, bus or by railway on the famous Ghan train. The Katherine Region stretches to the Queensland and West Australia borders and covers a huge area, larger in size than the state of Victoria. The region showcases a variety of landscapes such as eucalyptus tree forests, woodlands and tropical rainforest. Katherine is subject to distinct wet and dry seasons and experiences a subtropical climate. Katherine is known for its flooding due to its high rainfall and location on the river bank, and for fierce thunder and lightening storms in the wet season. The temperature varies from lows of 13 degrees in June/July up to highs of 37 degrees in November/December. Average daily temperatures are between 20 - 34 degrees celsius. Tourist attractions and activities in Katherine are mostly nature based and occur outdoors, such as camping, visiting the Katherine hot springs, canoeing, fishing and swimming in the Katherine River, taking a bushwalk in a national park or having a picnic near one of the 13 Katherine Gorges or Katherine Low Level Nature Park.